Ask most people about innovation in bearings and they will mention magnetic bearings. Certainly, they deserve the spotlight. 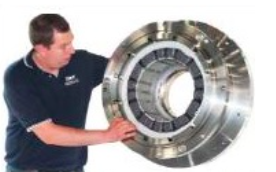 It seems that every turbine OEM and major bearing supplier has been eager to augment its arsenal with mag bearings. Examples include Dresser-Rand acquiring Synchrony, MAN Diesel & Turbo buying Mecos Traxler, SKF picking up S2M and Waukesha Bearings taking over Glacier Rotating Plant Bearings. The large number of mergers tells a tale of fast-paced development and rapidly maturing technology. “Mag bearings are crossing the chasm between highly specialized applications into more of a mainstream adoption by other machine builders,” said Lars Kahlman, Senior Application Specialist, SKF Fluid Machinery. Yet magnetic bearing breakthroughs may not even be regarded as being on the forefront of bearing technology. Indeed, recent work on air bearings and the incorporation of advanced materials, such as ceramics can possibly stake a claim as being on the cutting edge (Figure 1). Wherever you look, vendors, such as SKF, Dresser-Rand Synchrony (see Active Magnetic Bearings: An Alternative to Fluid Film Technology), Lufkin, Kingsbury, Waukesha Bearings, Mecos, GMN Bearing, Calnetix, LA Turbine, Capstone Turbine and New Way Air Bearings, are incorporating a host of new features into their wares, many of them squarely targeted at the turbomachinery market. The traditional bearing field, if it can still be called that, is a hotbed of innovation. Vendor after vendor has responded to the challenges posed by turbomachinery applications that drive the limits in terms of high temperatures, high pressures, harsh environments and faster machinery. “The big push is to find bearings that can handle faster speeds and heavier loads,” said Joseph Hart, RMT Bearings Sales Manager for Lufkin (part of GE Oil and Gas). Lufkin- RMT has introduced Spray-Bar Blocker and By-Pass Cooling advancements to its tilting pad journal bearings and thrust bearings. The goal is to reduce operating temperatures while handling increased load capacities and surface velocities. This same technology is offered in its Ultra Pressure Dam Sleeve Bearings and Ultra Thrust Bearings. 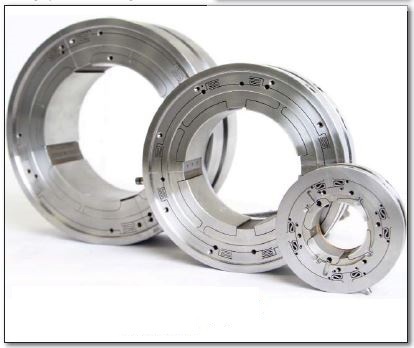 Waukesha Bearings (WB) offers tilting pad thrust, journal, combination and fixed profile bearings, used in pumps, motors, compressors, turbines, generators and gearboxes. 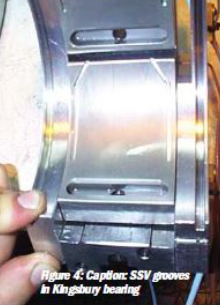 Examples include: Maxalign bearings that reduce power loss and handle misalignment in large shaft turbomachinery; Flexure Pivot bearings that eliminate pivot wear, pad flutter, and tolerance stack up; and MLSF bearings that improve stability and lifespan when compared to conventional floating ring bearings. In addition, WB supplies housed horizontal and vertical bearing assemblies. They include options such as cooling, electrical insulation, hydrostatic jacking, self-contained ring or disc lubrication, and instrumentation, for use in pumps, motors and generators in 21 applications, such as nuclear power stations and air-cooled units for LNG pumps. 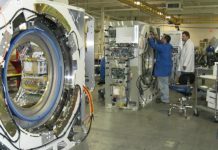 The company also employs advanced material bearings, such as Hiperax and Hidrax, to withstand high temperatures, high loads and abrasive materials, as well as axial and radial magnetic bearings, RDS auxiliary bearings, position sensors and control systems that increase reliability and availability and reduce the need for on-site maintenance. For small diameter shafts operating at high speeds and high loads, Flexure Pivot bearings address problems such as pivot wear and vibration increase. They have an integral pad-pivot-retainer design, manufactured as one piece (Figure 2). WB’s ISFD technology for radial bearings ups the damping capability to combat sub-synchronous vibrations. Figure 2: The flexure pivot tilting pad bearing introduced by Waukesha Buildings is a monolithic part, being turned and bored as a solid. The pivot pads are mostly separated from the structure by precision machining. Additionally, WB is a presence in magnetic bearings. Its compact Zephyr controller can fit a redundant controller configuration in the same space envelope as older nonredundant controllers. The controllers for these magnetic bearing can measure and process all data required to commission the bearing system, eliminating the need for ancillary equipment such as signal analyzers. These controllers can now be placed 500 meters away from the machine, said Richard Shultz, Chief Engineer at WB. 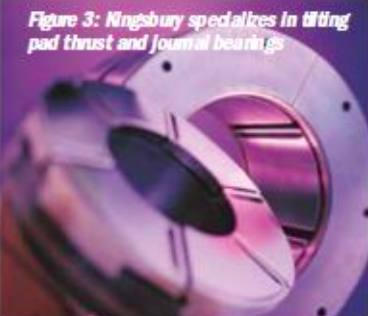 Kingsbury specializes in tilting pad thrust and journal bearings, with applications in turbines, compressors, generators, motors, pumps, gearboxes and auxiliary equipment. This includes tilting-pad thrust bearings, which incorporate leveling plates to equalize the load among the individual pads and accommodate misalignment between the collar and housing. The equalizing feature provides higher load capacity (Figure 3). Non-equalizing tilting-pad thrust bearings, as the name implies, have no equalization system, which reduces the overall axial height of the bearing. These Kingsbury bearings are best for applications with axial space limitations. The design requires tighter bearing and casing manufacturing tolerances. A means for adjustment is sometimes required to align the bearings and rotor during assembly. 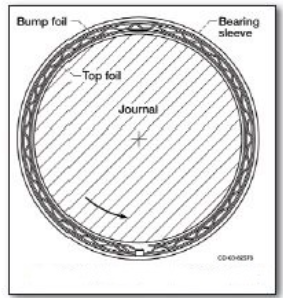 In addition, Kingsbury supplies tiltingpad journal bearings that have several design variables that are used to attain reliable and stable machine performance. Tilt-pad pivot designs accommodate shaft misalignment. Direct lubrication bearings that introduce cool, fresh oil at the leading edge of the bearing pad, and reduce oil flow requirements and power loss in highspeed applications. Recent research, said DeCamillo, has been focused on a direct-lube design for journal bearings designated between-padgroove (BPG), which introduces direct lube technology in a more robust bearing design of simpler construction. SSV (subsynchronous vibration) grooves for use in direct lube journal bearings eliminate a low-amplitude, broadband, radial, sub-synchronous vibration (Figure 4). Two further features — high-speed tapers and axial dampers — address high temperatures and axial SSV encountered in thrust bearing applications at high-speed and low-load conditions. “SSV grooves, highspeed tapers, and axial dampers are being incorporated in many high-speed turbomachinery applications,” said DeCamillo. Work is also being done to replace the traditional babbitt material in bearings. 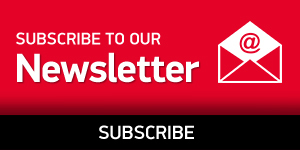 The temperature limitations of babbitt are being approached as turbomachinery technology continues to push bearing surface speed and load capacity requirements. Alternate materials are already used in niche applications such has PEEK (polyetheretherketone), other polymers and ceramics. SKF is very much on the forefront when it comes to the use of ceramics. Kahlman of SKF said that the use of new materials and combinations of materials to create application- specific solutions for industry challenges has led to mixing and matching of ceramic rolling element bearings, with stainless steel used for the rings. These are available from SKF in single-row, deep-groove ball bearings, angular contact ball bearings, 4-point contact ball bearings and cylindrical roller bearings. 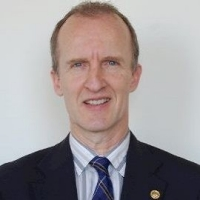 “They have been applied in various screw compressors for sour and other process gas applications and in high-performance pump applications for both cryogenic and subsea applications,” said Kahlman. Another recent development is the use of plasma coating on the outside diameter of a bearing used in electric motors, which insulates them from the passage of electric current through the bearing. These find application in some motor-driven drive trains in turbomachinery. 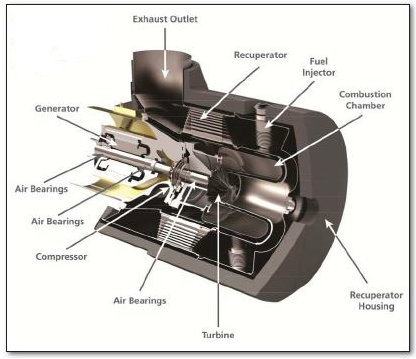 In the more experimental stage, rolling element bearings have been developed that are lubricated with pure refrigerant for centrifugal compressors and chillers, thereby eliminating the need for external lubrication. Sensorized bearing technology, too, has been developed for the oil & gas industry. This SKF unit acts as a non-drive end bearing to support the rotor shaft, and as an encoder to monitor and control a motor. It bolts to the rotor shaft and motor housing shield. The SKF sensor bearing unit consists of an aluminum end cover, hybrid bearing, impulse ring and sensor adjusted, lubricated and sealed at the factory. 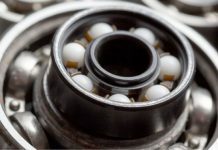 It contains a hybrid, deep-groove ball or cylindrical roller bearing, a magnetic impulse ring and a sensor embedded in the end cover and connecting cables. The impulse ring, fixed to the rotating inner ring of the bearing, is magnetized with a sequence of north and south magnetic poles. A number of digital impulses, equal to the number of pole pairs on the impulse ring, are generated on each revolution. The output signal provides information about speed and direction of rotation. For critical applications, units are available with a second sensor for mechanical redundancy. And some sensorized bearings are embedded with condition monitoring capabilities that can communicate with the outside world. In addition, SKF has upgraded its ball, cylindrical and tapered bearings to gain extended life in more conventional turbomachinery applications. Known as the Explorer series, their longer life is attributed to material improvements and subtle internal geometry changes. The SKF Explorer performance class, for example, includes cylindrical roller bearings designed for heavy industrial applications. They go up to 420 mm outside diameter and are said to run cooler, provide a 15% higher load-carrying capacity, and longer life compared to standard cylindrical roller bearings. In applications with frequent starts and stops, conventional bearings can suffer due to slow formation of a lubricant film. SKF’s approach is to create a surface finish that promotes the formation of the lubricant film via a reengineered PEEK cage and a 40° contact angle. The first successful application of active magnetic bearings for industrial turbomachinery dates back to 1976. French company S2M (now part of SKF) pioneered the technology and developed contactless magnetic bearings for turbo-molecular pumps (TMPs). 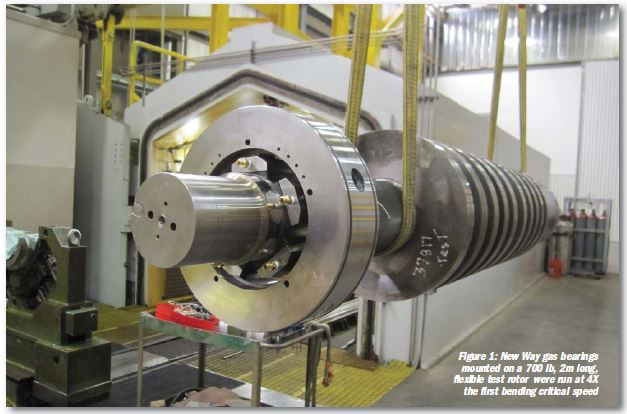 He added that the power range of magnetic bearings in rotating machinery varies from several hundred horsepower in the case of a small-frame turboexpander and up to 43,000 HP (32+ MW) for a natural gas pipeline compressor (Figure 5). 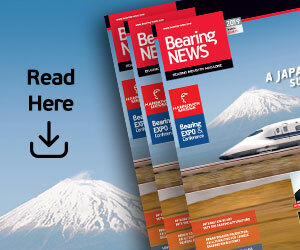 “There is a little bit of magic when a 10- ton rotor supported by mag bearings continues with a smooth rotation showing just 20 microns of vibration, as is the case with a 9 MW oil-free gas turbine coupled to a power generator in operation in a dozen Russian combined heat and power plants,” said Gubaidullin. SKF S2M mag bearings are also used in GE’s ICL integrated motor-compressor line. The compressor and motor combined in a hermetically sealed casing are running on magnetic bearings immersed in pressurized clean gas. These units do not require a lubrication oil system, gear box, dry gas seals or external cooling system. One of the more challenging ongoing projects is subsea compression. SKF S2M’s magnetic bearings are being used to equip the compressors and high-speed motors for the Åsgard Subsea Gas Compression System off the Norwegian coast (Turbomachinery International Sep/Oct 2014), scheduled for installation in 2015. The core of subsea compression technology is an oil-free integrated motor compressor designed to boost the falling gas flow rate. The first motor-driven compressor of this kind was developed in the early 1990s. These integrated compressors with SKF S2M magnetic bearings have since accumulated millions of hours of service time. This subsea work has given rise to a new range of electromechanical and electronic parts to support magnetic bearings used in turbomachinery. SKF is now commercializing its E300V2 electronic control cabinet. Features include remote monitoring and automatic diagnostics with a view to providing plant operators with a higher degree of autonomy. A high-resolution, data-acquisition system monitors operating parameters, such as rotation speed, vibrations and temperatures in real time. The user can visualize rotation orbits, 3D waterfalls and graphs with spectral analyses, time snapshots and other bearing-related parameters. As magnetic bearing applications have grown in popularity, their lower pricing has made them more accessible. Calnetix Powerflux Magnetic Bearings, for example, have been incorporated into several turbomachinery applications. They have been used to meet the shockand- vibration requirements of U.S. Navy chiller applications for their next generation high-efficiency chiller systems. They also form the backbone of a family of high-speed integral, oil-free air compressors. This consists of an integrated, highspeed turbine expander and high-efficiency generator. The magnetic bearings allow for non-contact operation and have lower power consumption compared to ball or fluid-film bearings. They also monitor rotor imbalance, and need no lubrication system or seals. These systems are being used in various small-scale, heat-recovery applications throughout the world. On the development front, Larry Hawkins, Director of Technology, Magnetic Bearings at Calnetix, called attention to a constant flux edge sensor. It is used to measure axial displacement from a radial surface in the presence of external fields. Additionally, the company has begun production of a new combination bearing topology (radial and axial support in one structure). Magnetic bearings need the support of touchdown bearings. They come into play during any mag bearing interruption, such as when the unit is still spinning but creates so much torque that the mag bearings cannot hold the shaft in position. As a result, touchdown bearings are needed for a fraction of a second. “The most obvious use of touchdown bearings would be an electrical loss where the rotor would drop onto the backup bearings and coast down,” said Andy Robbins, Vice President of Engineering, GMN Bearing USA. His company supports the turbomachinery market with touchdown bearings for magnetic bearings and traditional dutycycle bearings. Its touchdown bearings are being used in such applications as highspeed motors, turboexpanders and highspeed pumps. Robbins said the touchdown bearing market has entered an expansion phase as magnetic bearings grow in demand. The main increase is in the amount of testing, but there are small TMPs that already have magnetic bearings and back up bearings in full production. Magnetic bearings are not the only approach to oil-free bearings. There is growing interest and deployment of air bearings (a.k.a. foil gas or gas bearings) as an alternative way to eliminate the need for oil. Christopher DellaCorte, NASA’s Senior Technologist for Tribology & Rotating Machinery at the Glenn Research Center in Cleveland, led the Oil-Free Turbomachinery team that conducted research in high-temperature foil gas bearings for eventual use in gas turbines. “In the long term, we expect this technology to impact power generation, automotive turbocharging and microturbine propulsion, Unmanned Aerial Vehicle (UAV) turbines, air compression and blowing, and space power generation,” he said. Having answered many of the fundamental questions about foil gas bearings and their potential, the NASA team is now developing corrosion resistant, shockproof ball bearings and gears made from NiTi-based superelastic materials. Foil gas bearings rely upon a self-generated gas film for lubrication. The film viscosity (and hence the pressure) is low as the viscosity of air is much lower than oil. Pressures are directly proportional to surface velocity (rpm times shaft diameter) and are typically tens of psi, said DellaCorte, whereas oil-lubricated bearings have film pressures of hundreds of psi. Therefore, foil gas bearings thrive on light loads and high speeds. As for going larger than that, he believes that some type of hybridization might be required, perhaps using mag bearings for rotor lift at zero rpm and for damping. Bottom line: engineering load capacity is always going to be limited to 10-to-50 psi, which limits machine size. NASA has developed PS300 and PS400 tribocoatings for high-temperature bearings and durability. They enable foil bearings to endure tens of thousands of start-stop rubs without undue foil wear. This opens up the field for oil-free turbochargers for cars and trucks, fuel cell compressors and microturbines for hybrid cars. DellaCorte thinks that once turbochargers with foil gas bearings become broadly available in the automotive market as a further way to lower emissions, improve fuel economy and reduce turbo failures, it will open the door to this bearing technology becoming more readily available and far more economical to deploy. Bump foil bearings (BFB) are the most common type of foil bearing with a long history in air cycle machines onboard military and commercial aircraft. They are now also commonly employed in microturbines. They consist of a flat piece of metal that is stamped to have ridges that constitute the bumps, then rolled and inserted into a precision bore. A thin top sleeve, often with a low friction coating is inserted inside the bumps. Generally 25-to-50 μ of radial clearance is designed between the top foil face and the outside diameter of the rotor (Figure 6). Mesh foil bearings are also attracting interest, added Devitt. The idea is that at least some of the load transmitted through the pad is supported by a metal wire mesh. The mesh may be of stainless steel, aluminum or copper. The friction losses between the wires in the mesh as they spring results in a damping mechanism that is insensitive even to the high heat levels in gas turbines. New Way has been studying the issue of damping in turbomachinery and specifically flexible rotors supported on externally pressurized gas bearings using multiple gases. On nitrogen, temperature probes just below the bearing face showed a 1°C temperature rise after 20 min at 9,000 rpm, while with CO2, the bearings cooled 2°C. Devitt believes this is an industry first for gas bearings (Figure 1). New Way has a line of externally pressurized radial gas bearings. 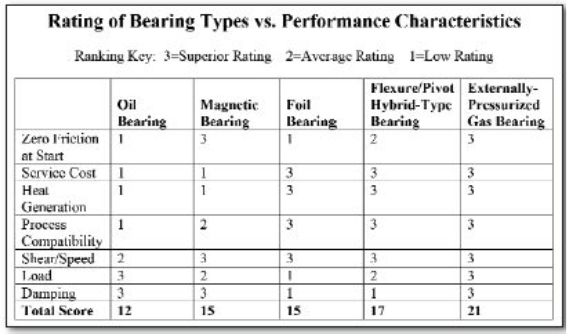 These bearings, said Devitt, compare favorably with other types of bearings (Table A). They are appropriate for highly loaded applications: applying a 600 psi supply pressure will result in 300-to-400 psi of average pressure in the gap. They fit in the same space as tilting pad oil bearings, but can operate on process gases, and up to 600°C in oxygen and higher if oxidation is not an issue. Other companies, such as Barber Nichols and Capstone Turbine, are involved in gas bearing development. 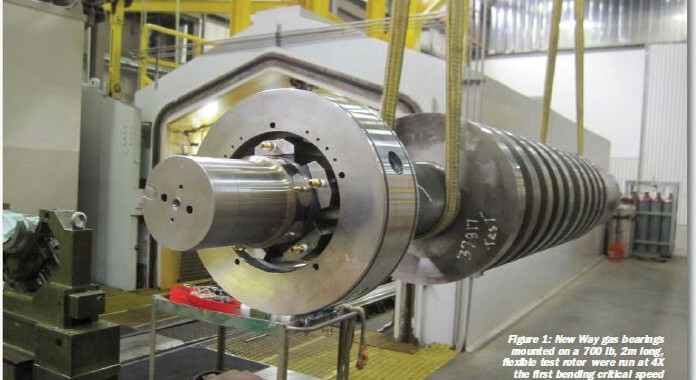 Barber Nichols deploys foil gas bearings operating on supercritical CO2 (SCO2) (Turbomachinery International Sept/Oct 2012). The power density of supercritical CO2 is such that a 1 MW impeller is only 1.5” diameter. Air bearing dampening is accomplished by the underspring, and forces from the boundary layer of air, he explained. Air bearings can support the rotation of the rotor group up to speeds of 96,000 rpm, and the maintenance interval is greater than 40,000 hours. Capstone Turbine uses air bearings because of their excellent performance when operating in hot environments, compared with oil and magnetic bearings. “Oil lubricated bearings coke when exposed to excessive heat and can require added cooling,” said Robert Gleason, Capstone Turbine’s Senior Vice President of Product Development. They also require schedule changes to maintain health of oil, present environmental hazards and are not conducive to tight rotational clearances. Magnetic bearings can require added cooling and additional controls, are sensitive to heat and demagnetization, and require backup bearings in the event of an overload or bearing failure. Capstone is working with the U.S. Department of Energy on a new generation of air bearings to provide high dynamic load capacity at high temperatures. These are intended for use in next generation Capstone products including the dual spool C370 microturbine system (Figure).